This Fortuny wall hanging made from Vintage 1920's Dandolo design, a Rococo style pattern of central bouquets of flowers, framed by garlands. Piece measures 82" wide by 65" long. Surrounded by 2" border that is one continuous piece. Field is three panels joined and expertly matched. Finished piece is lined and interlined with rod pocket and weighted bottom hem. Piece is 82" wide by 65"long. 18th century Italian Chalice veil. Exquisite embroidery on white silk ground, using fine silver metal threads and purl with intricate silk embroidery floral accents. Floral sprays radiate towards center from the corners. Pairs of Dolphins faces worked in fine silver metal threads with scales in silver threads alternating with pale blue silk, above Crown Imperial Fritillaria in green silk and silver metal, located at the center bottom edge all four sides. The silver metal embroidery is worked in many different patterns with amazing detail, accented with beads of amber. Edged with fine silver metallic torchon lace trim. Condition is wonderful and consistent with age. Remounted to ocean blue silk velvet on wood frame. Frame has the name of C. Winter of Wimbleton possibly a previous owner. White silk ground with spectacular gold metallic embroidery. 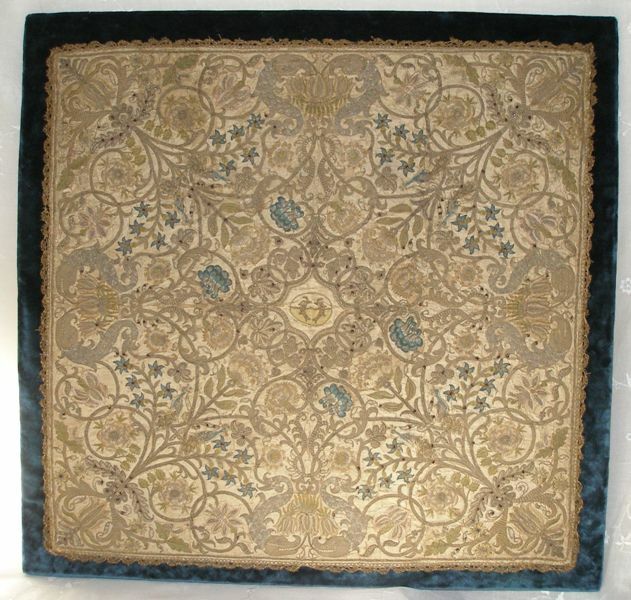 Central vertical borders thickly worked in gold gilt thread. Gold gilt embroidery worked in various techniques laid work, couching, padded couching. Cartouche like shapes along center from which sprays of foliage and urn shapes grow and overlap the vertical borders also worked in fine gold gilt threads. Skillful multicolored silk floral embroidery throughout. Once a chasuble, the edges were turned under to create the now rectangle shape, edged with 18th century gold metallic fringe approximately 1" long and fine scalloped trim. Backed with faded pale blue satin lining. be displayed carefully. 35 inches long by 24 1/2 inches wide. A saddle-back of moss green silk velvet worked in heavy gold metal threads. wear to the silk velvet as well as some discoloration on the right side. Unlined. Lucrezia pattern in cobalt blue with parchment overlay. Narrow 24" wide with Soc. An. Fortuny stamp on selvage. Edged with vintage 1930's leaf border also stamped Soc. An. Fortuny in red dye. Details: 58 1/2" long by 30 1/2" wide. Lined and interlined with rod pocket. Signature exposed at back. Interesting early 1920's Fortuny wall haning. Pattern name is unknown,foliate scrolls in heart shape with floral accents. Typical of Fortuny's early work with subtle variations in the background colors. Cobalt blue ground with reddish brown highlights, parchment overlay. Matching border. Unsigned. 24 1/2" wide by 48" long. Professionally lined and interlined with rod pocket at top. small cut in the selvage. Maker unknown. Estimated to 1930's. Labeled "Jamicia". Ecru linen ground with silk velour/ velvet labeled "Walnut" color. Thistle pattern with floral garland cartouch. Thistle pattern in walunt color with silver accents, the same silver appear in the cartouch background. 49" long by 24" wide. Pattern repeats 24" vertically.